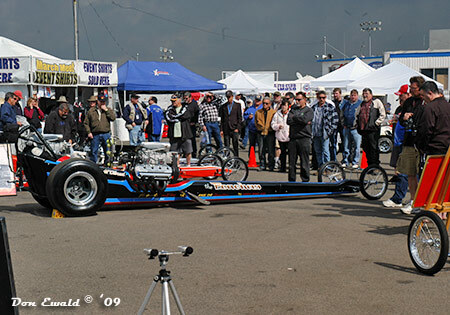 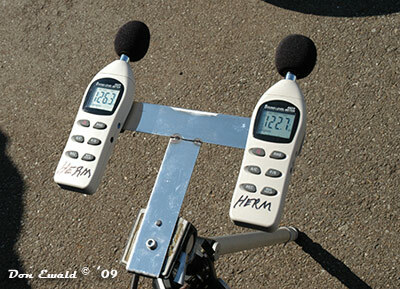 Bakersfield, CA - March 06-08, 2009: The 51st March Meet was in short an incredible event. 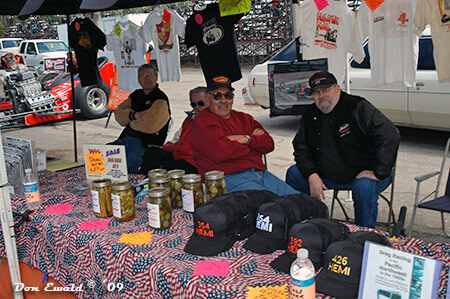 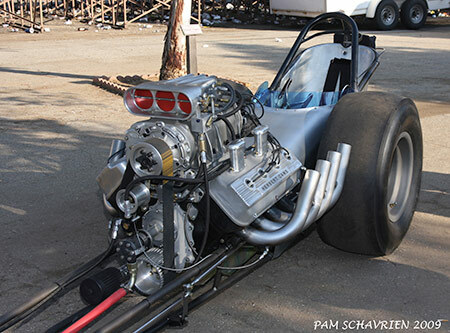 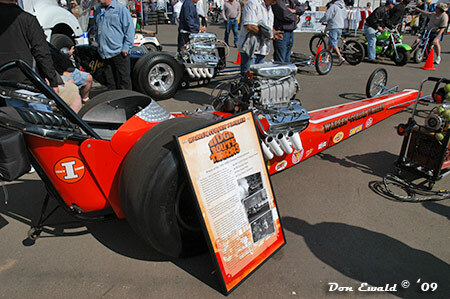 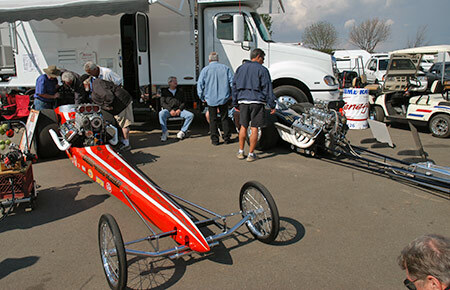 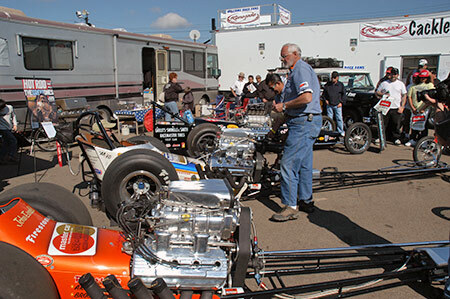 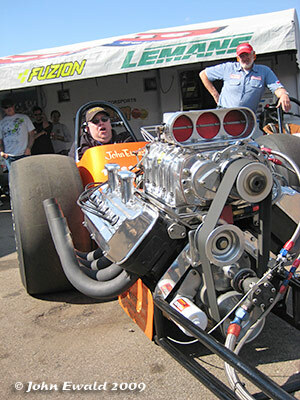 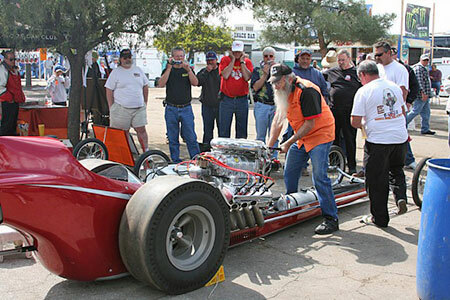 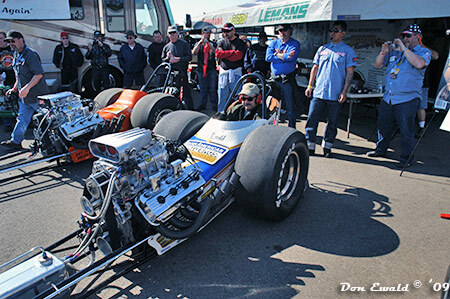 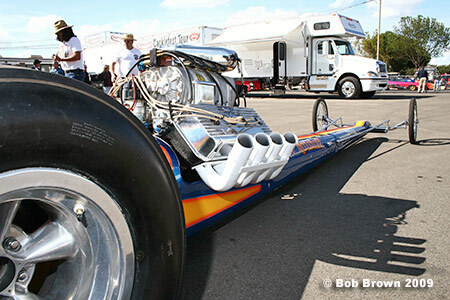 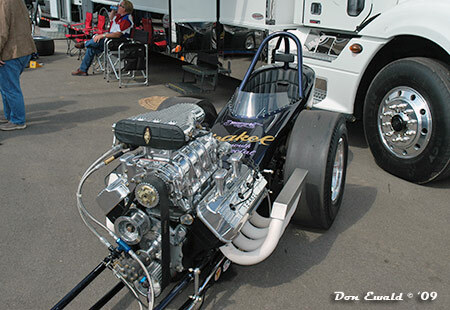 Under three days of Chamber of Commerce skies, the largest car count/spectator attendance in history filled the hallowed Famoso Dragstrip grounds for the event that lived up to its star billing - and more. 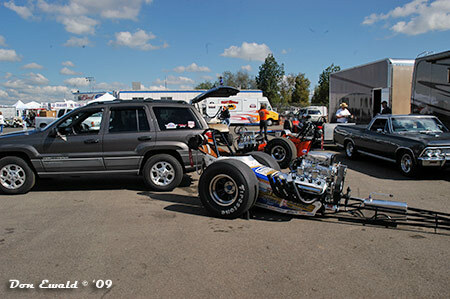 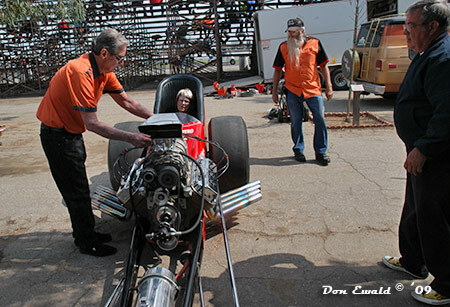 John and Blake Bowser along with one of the best crews ever assembled put on a drag race/car show for the ages. 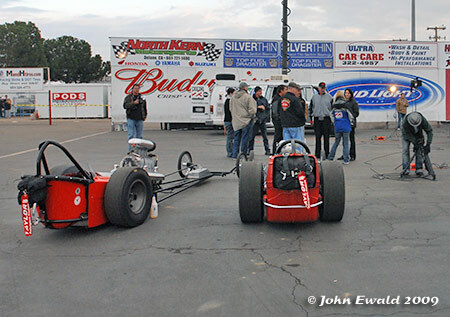 From the full pits on Thursday to the Winners Circle shots on Sunday this was an event brimming with an accommodating facility, incredible racing surface, friendly staff, full bore fans, record performances and a Cacklefest. 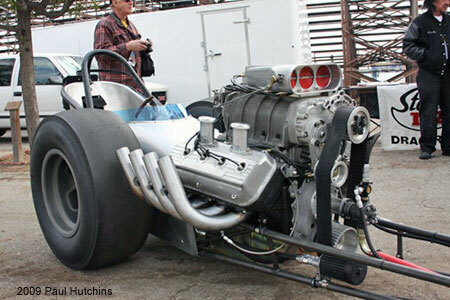 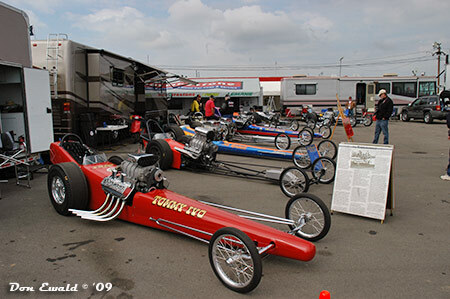 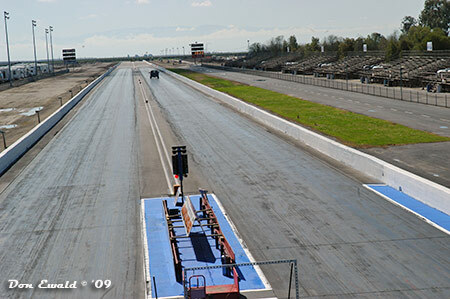 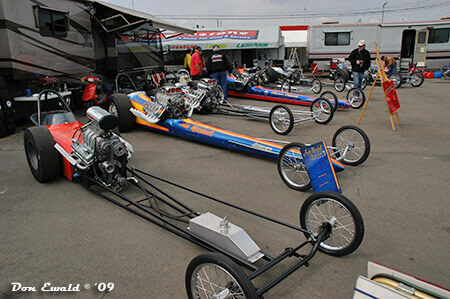 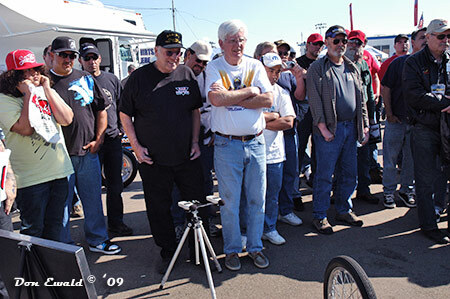 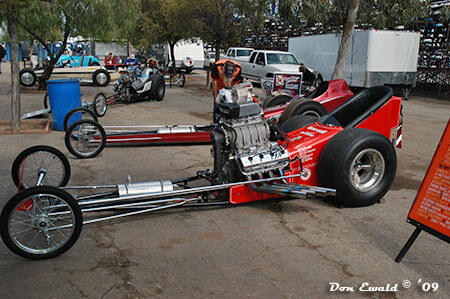 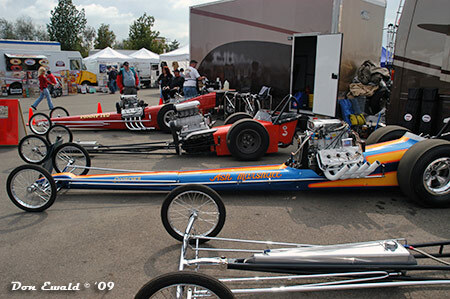 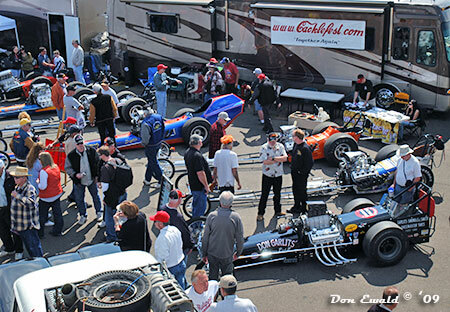 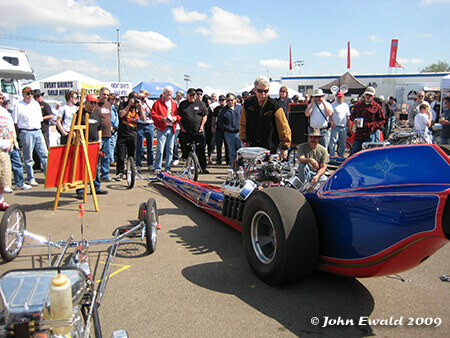 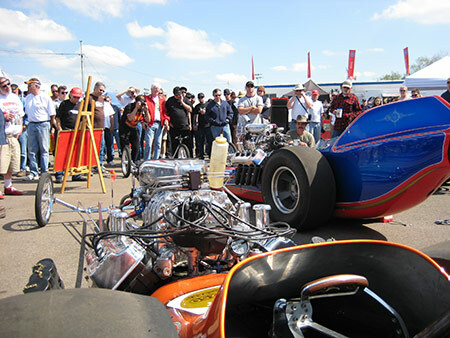 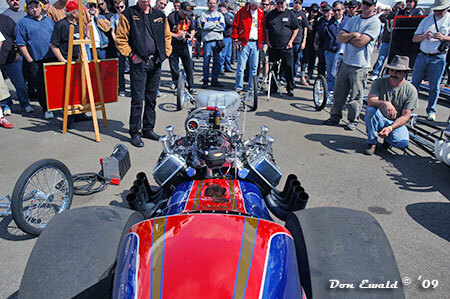 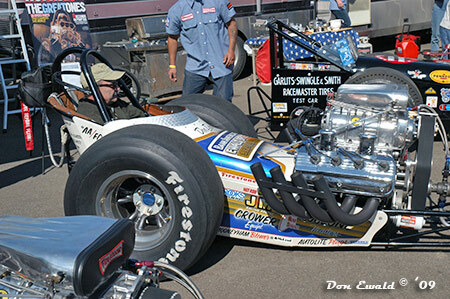 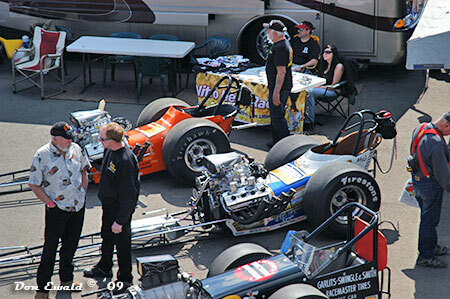 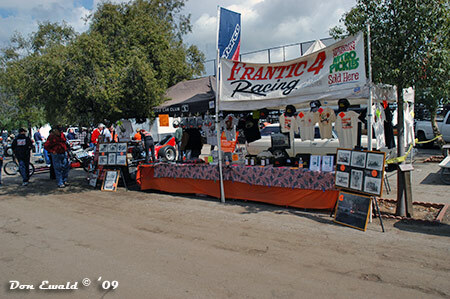 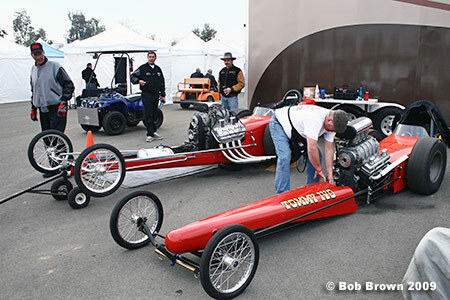 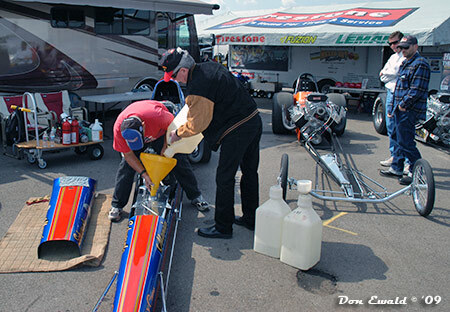 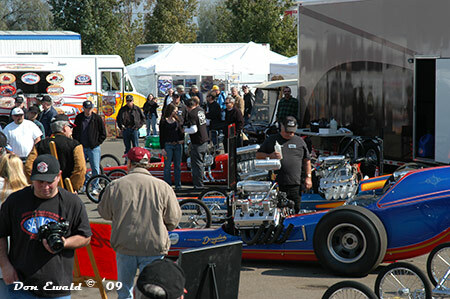 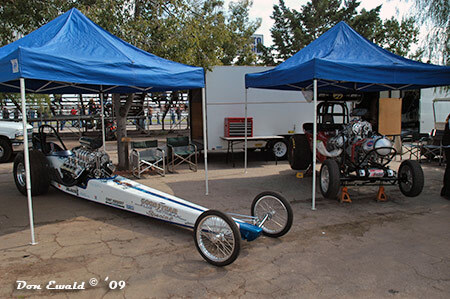 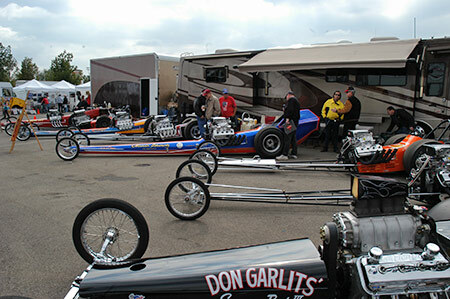 Unlike the NHRA CHRR, there was not 60+ cacklecars at the March Meet, but 20 of the best accepted an invitation and filled the head of the pits and The Grove past the 1st grandstand. 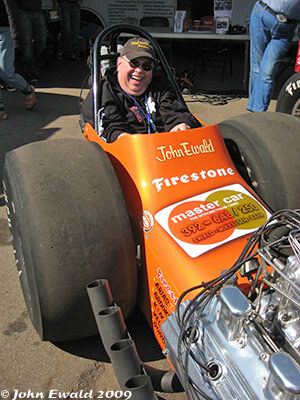 The cars were on display all with with most doing static fire-ups every day. 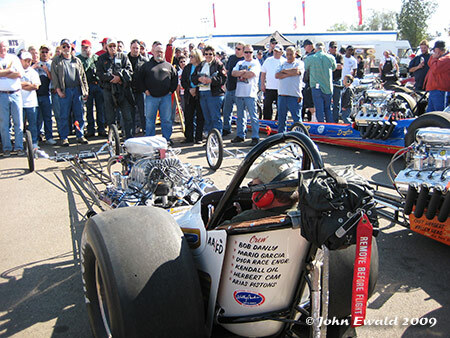 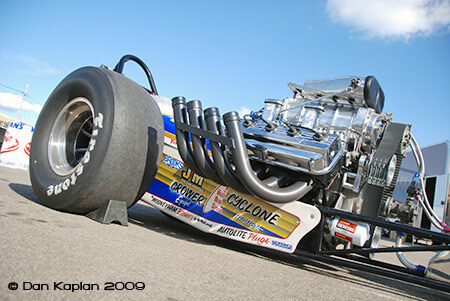 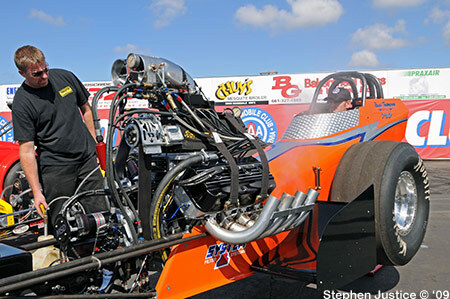 On Saturday they were all lined up in front of the pit side grandstands and gave the crowd a full dose of nitro. 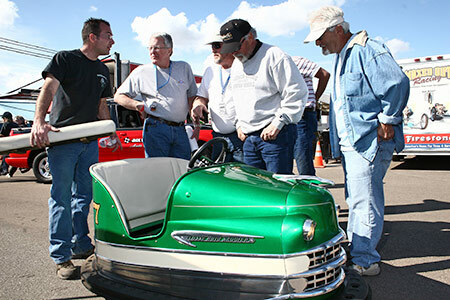 As always, it was a fun deal for the car owners, those who got to sit in them and most of all the fans. 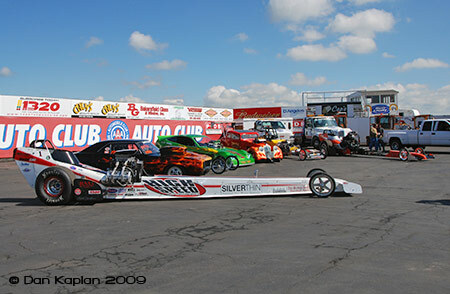 Without further ado, enjoy these photos documenting the show. 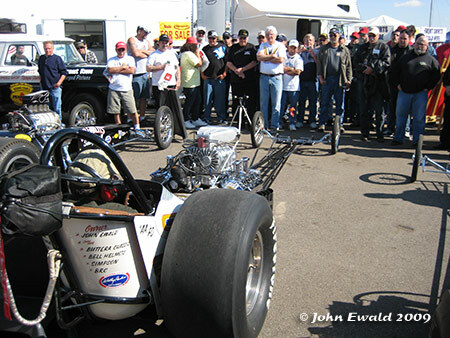 Photos by: Bob Brown, Stephen Justice, Dan Kaplan, Tim Hanaseth, Pam Schavrien, Paul Hutchins, Darrell Conrad, John Ewald and Don Ewald. 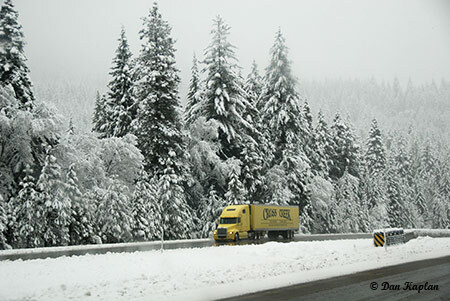 The weekend started on an uncertain note for Don Ewald and Dan Kaplan on Wednesday when heavy snow made coming over the Siskiyou Mountains from Oregon to NoCal an interesting journey. 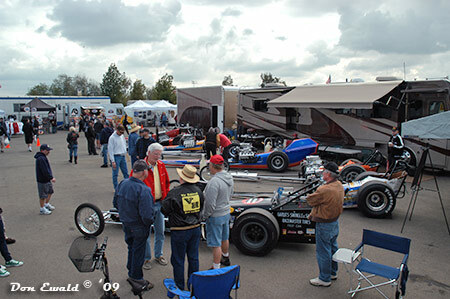 At this point the weather reports from Kern County for the weekend were iffy so the whole trip was a leap of faith from the start. 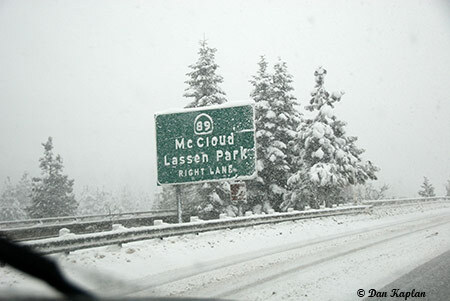 But what a difference a day made. 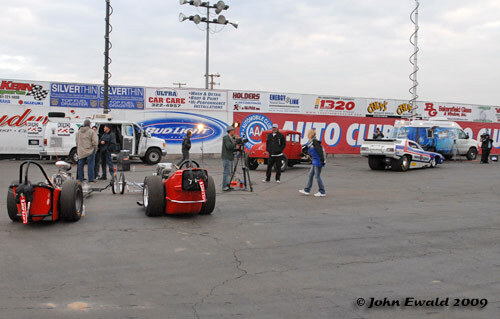 Although Thursday brought cold temps with overcast skies, the Media Day production went off without a hitch. 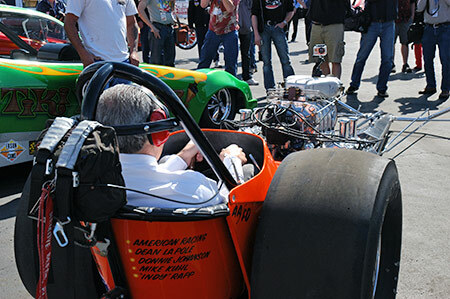 Cars from every class including Cacklefest were on display and featured for the annual Media Day with prominent city and state officials and local TV stations and newspapers in attendance. 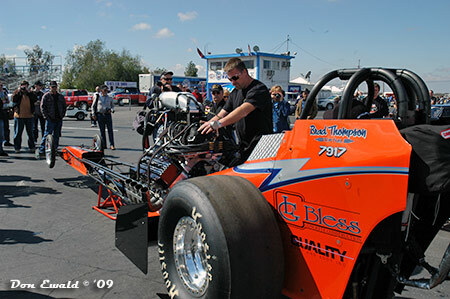 Track Manager, Blake Bowser was the MC and ultimately the recipient of several awards. 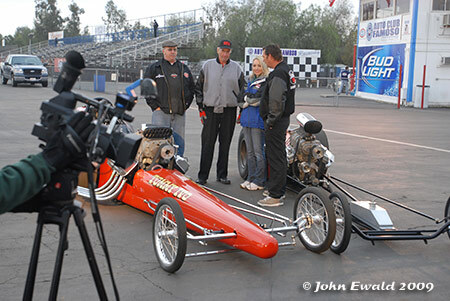 Among all the sports media, Mike Griffith of the Bakersfield Californian was there, along with Suzanne Grant of KUZZ radio and KBAK-TV came out to shoot for the local news. 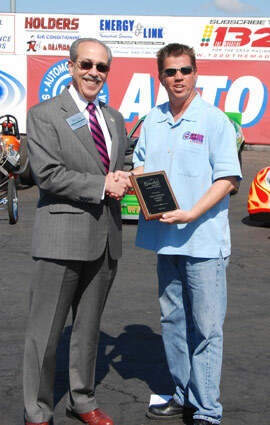 Don Cohen, Bakersfield Convention and Visitors Bureau Manager presented Blake with a plaque of appreciation from the city. 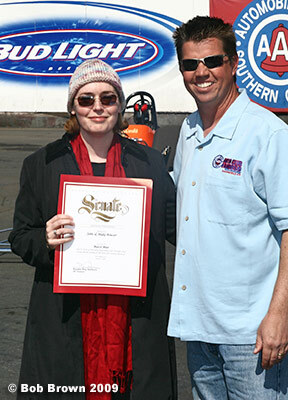 Kimberly Mullins, the Field Representative for Supervisor Jon McQuiston's office. 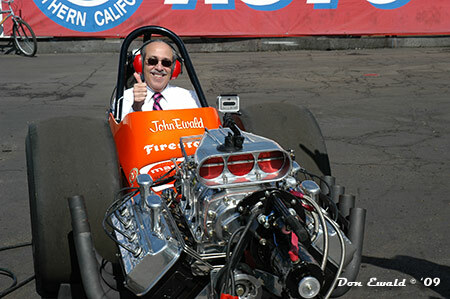 (Kern County Supervisor). 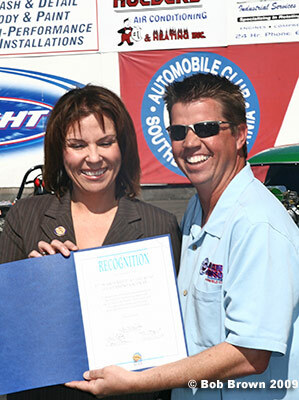 Tracey LaMonica, the Field Rep from Senator Roy Ashburn's office (California State Senator). 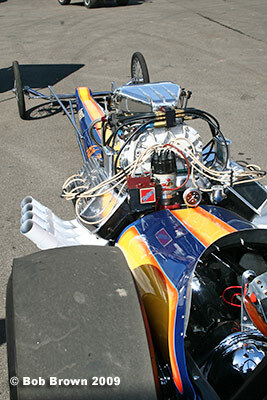 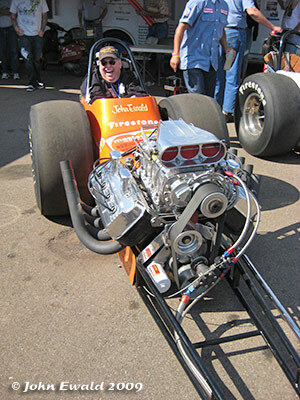 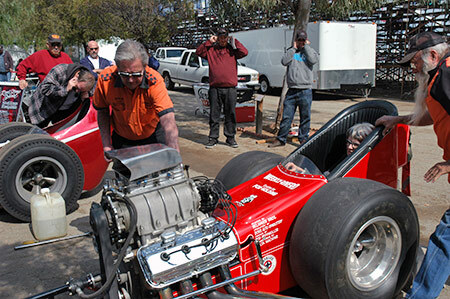 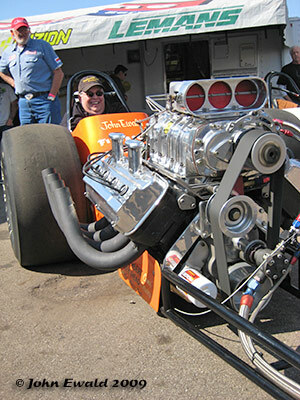 Following the presentations Brad Thompson and his new NTF car supplied to first dose of nitro of the weekend. 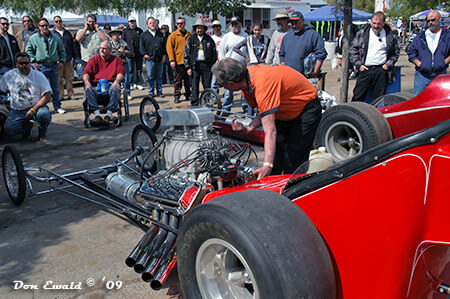 Following Thompson was Don Cohen in John Ewald's Mastercar for the first cacklecar fire-up of the event. 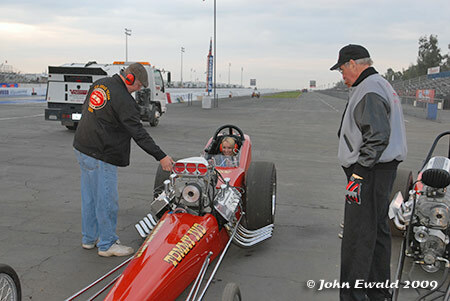 March Meet PR Direction Bill Groak got his first fire-up in a race car as well. 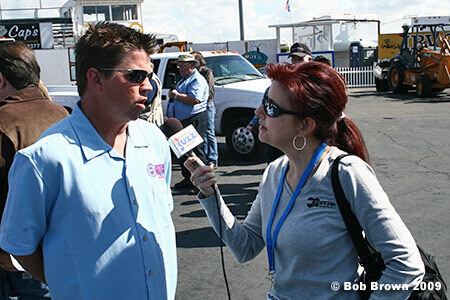 Suzanne Grant of KUZZ radio. 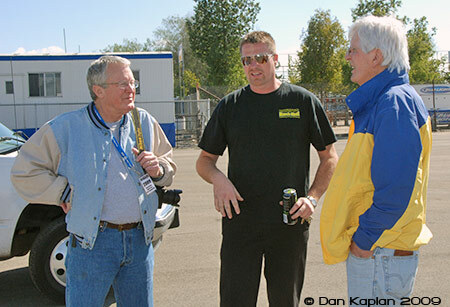 Don Cohen with Blake and camera shy John Bowser. 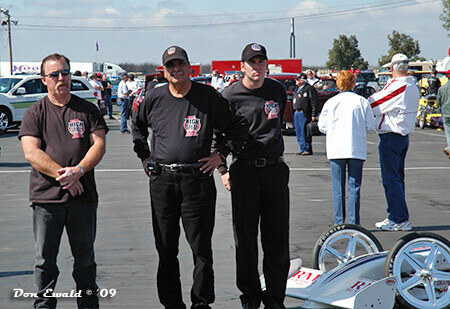 Representing HSMS was Frankie Hedge, CEO Dale Singh and co-crew chief and test driver Sean Bellemeur. 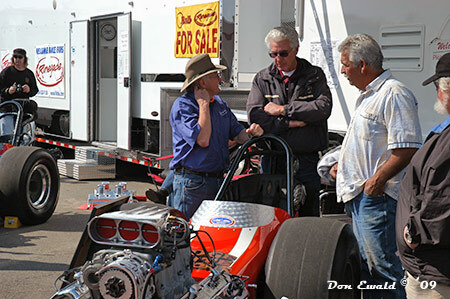 Don Ewald, Brad Thompson and Pete Starrett. 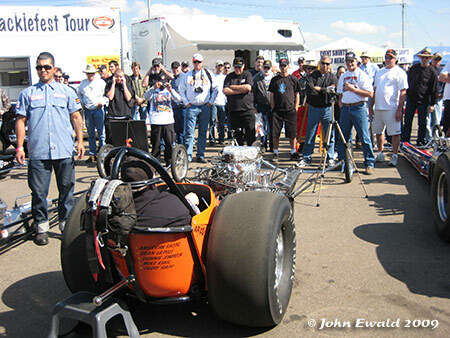 John Ewald heading back to the pits in his Mastercar. 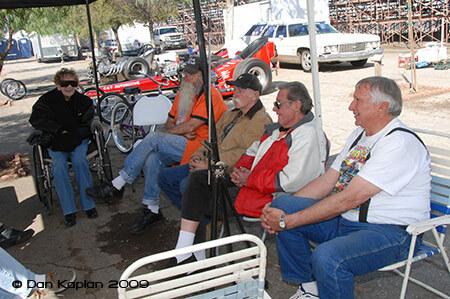 Back in the pits the folks in The Grove were set up (or getting set up) and in relax mode. 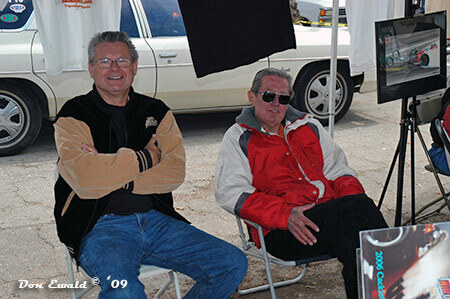 In the Frantic 4 area was Julie Lee, Dennis Prater, Darrell Tedford, Norm Weekly and Ron Miller. 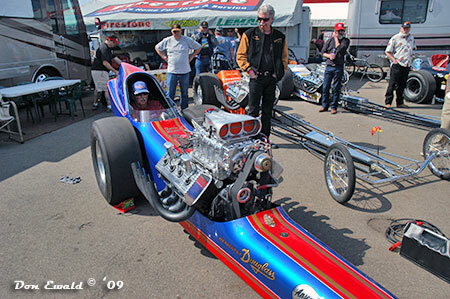 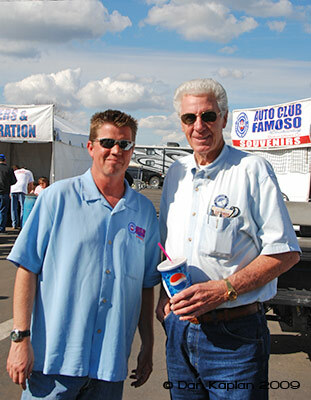 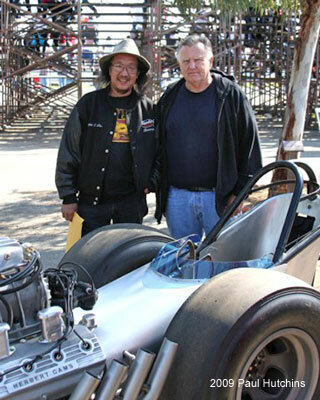 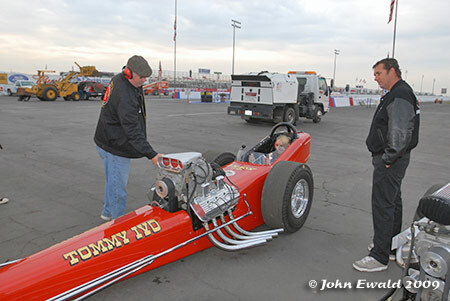 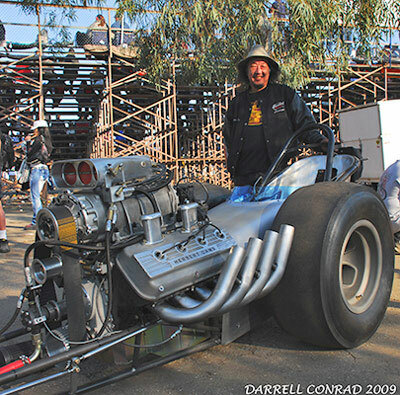 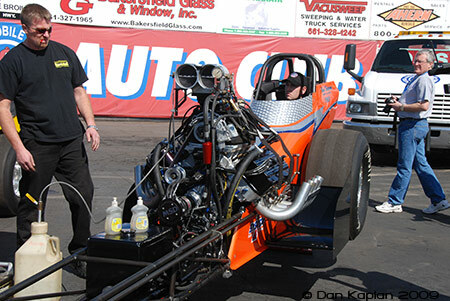 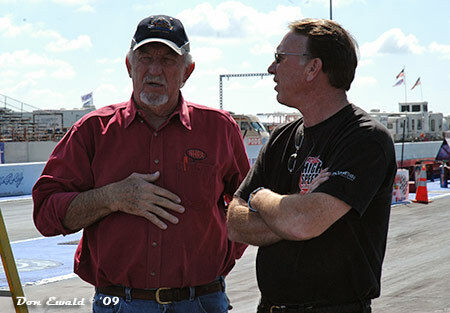 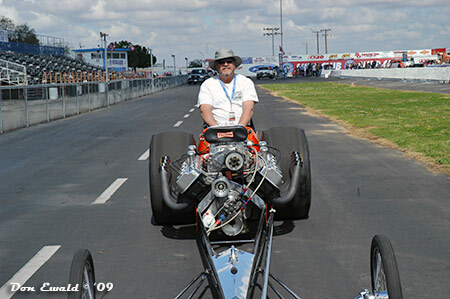 Blake Bowser and the most famous drag racer in Bakersfield history, James Warren. 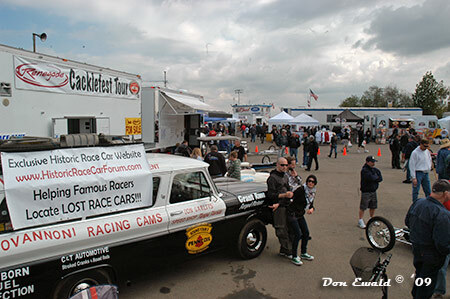 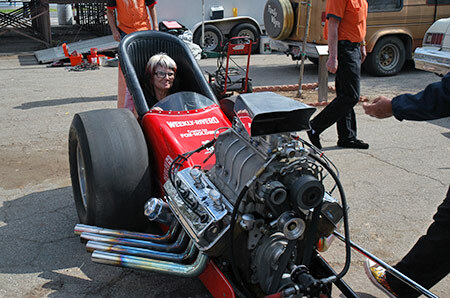 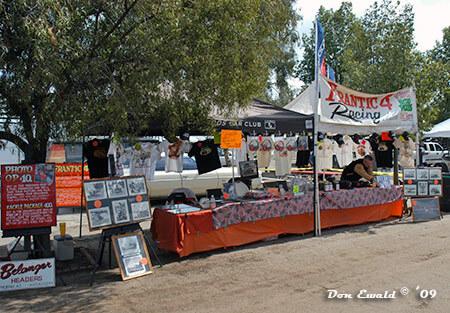 The Bowser's, being huge supporters of drag racing history, gave the cacklecars a huge hunk of prime real estate to set up the main display and by early Thursday it was already shaping up nicely. 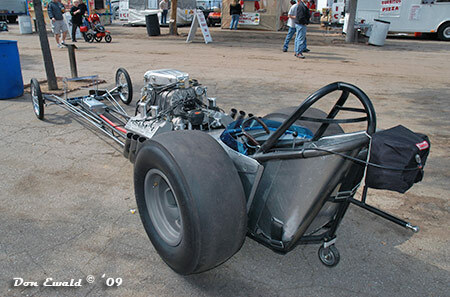 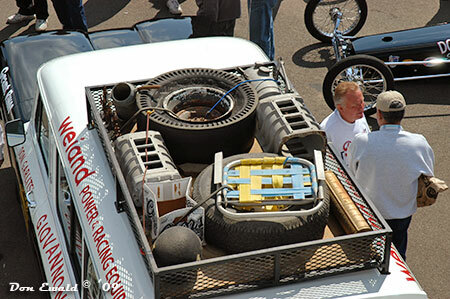 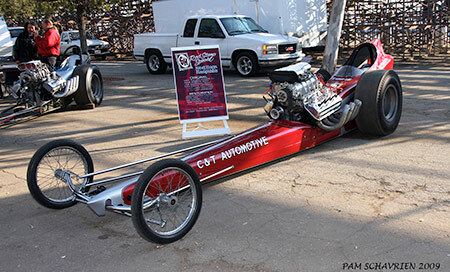 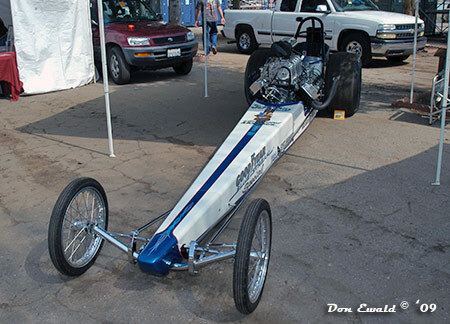 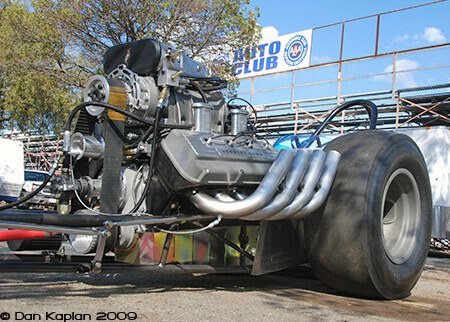 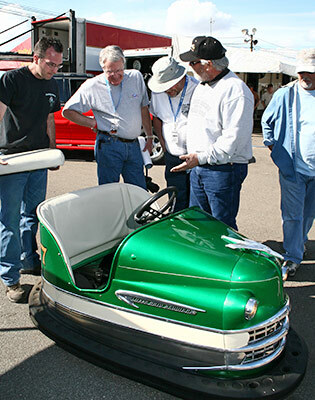 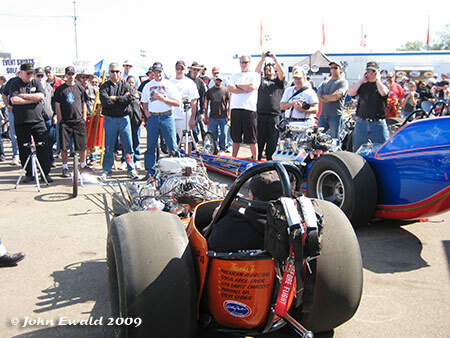 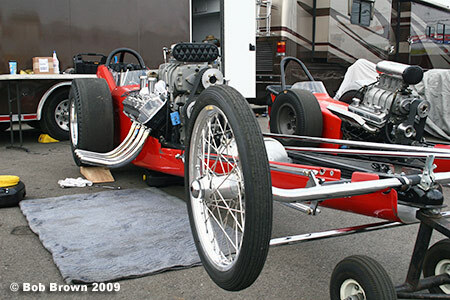 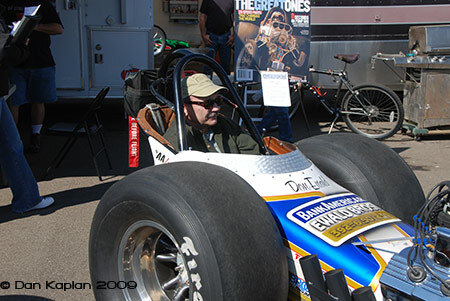 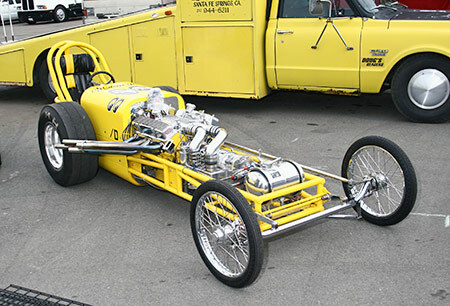 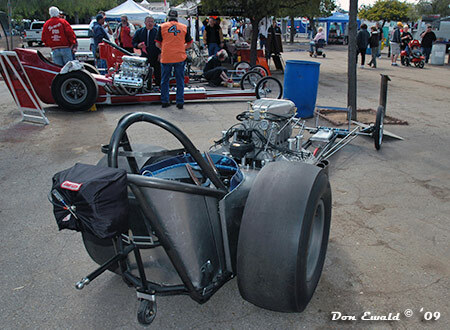 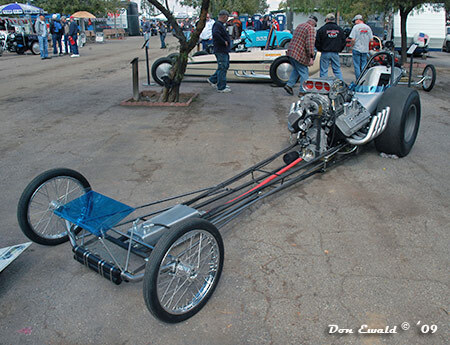 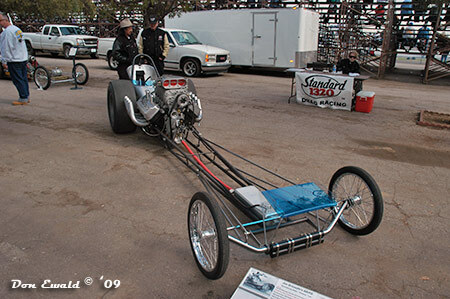 The trickest pit cart award went to this real deal bumper car fitted on a custom chassis and powered by a small motorcycle engine. 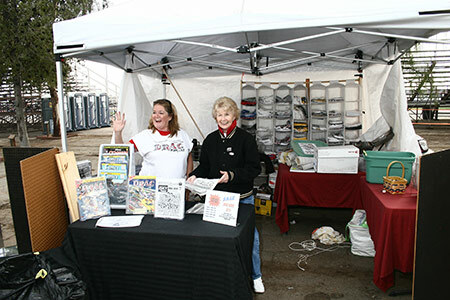 Set up day left plenty of time to BS. 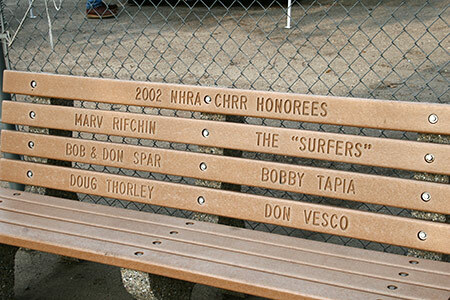 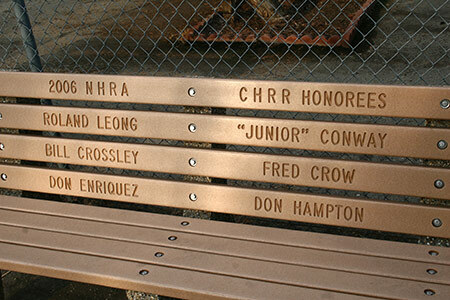 Another new addition to The Patch are these benches acknowledging past CHRR honorees. 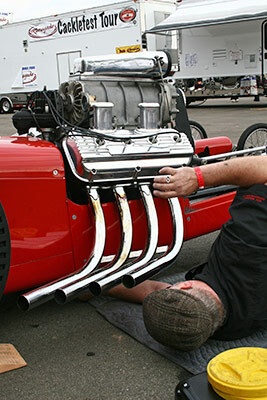 Believe it or not, even cacklecars need regular oil changes. 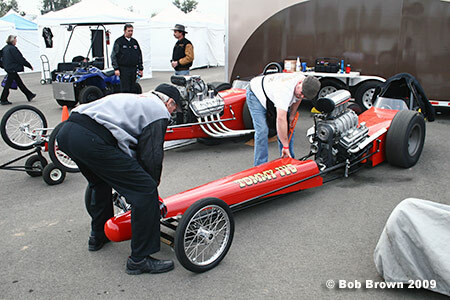 Ron and Kol Johnson did so on the Barnstormer. 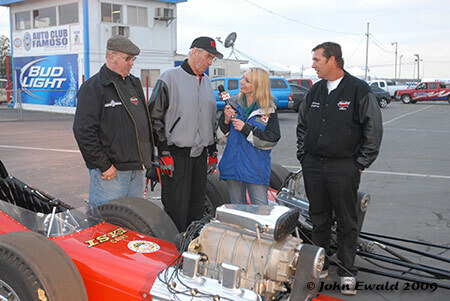 Friday morning, while most of us were still in bed, Ron and Kol Johnson along with Marc McCormick were on the track to do a live KERO-TV spot with reporter Melissa Vreeman on the local news. 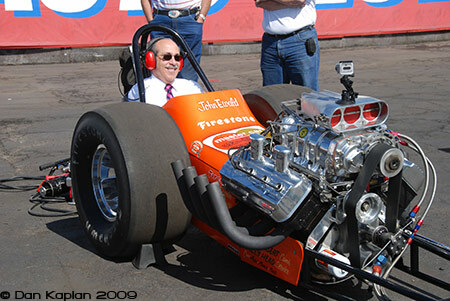 Rusk also got in the car for a live, on air fire-up. 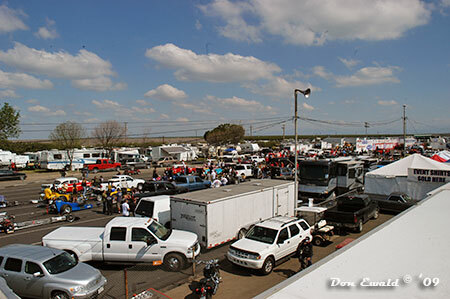 With the sky still filled with clouds the main cacklecar area was all but full before noon on Friday. 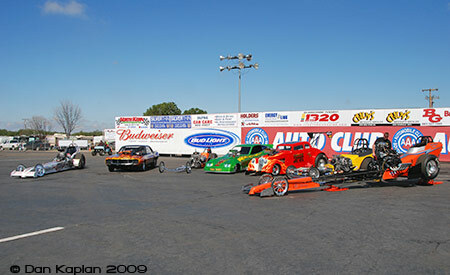 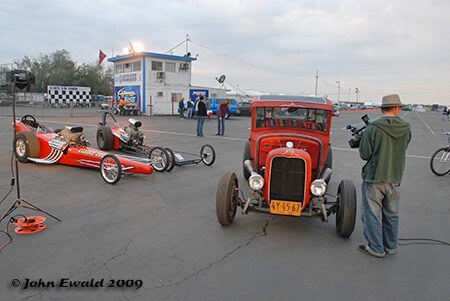 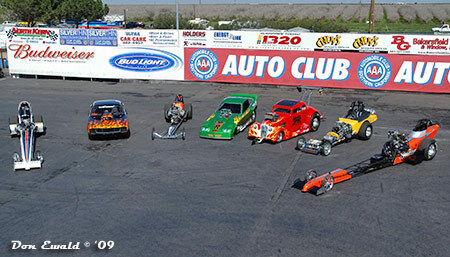 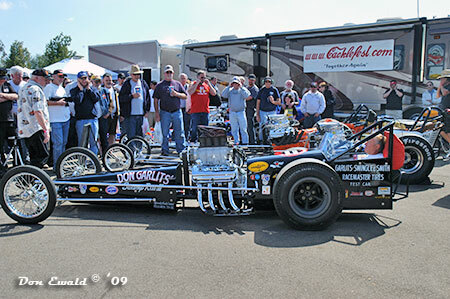 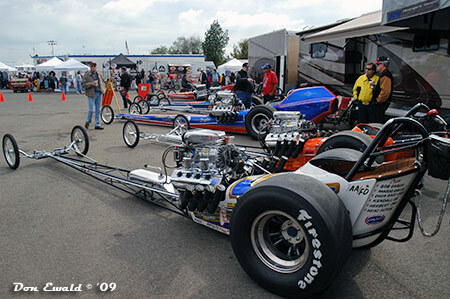 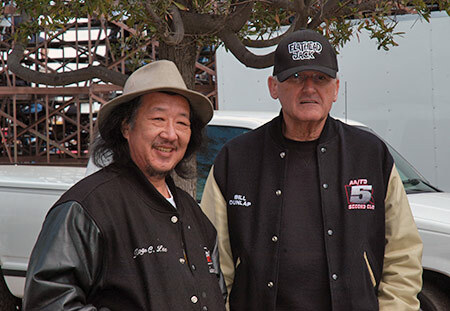 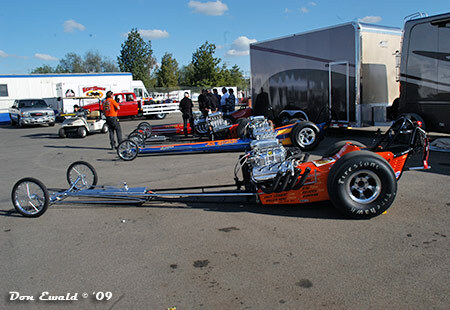 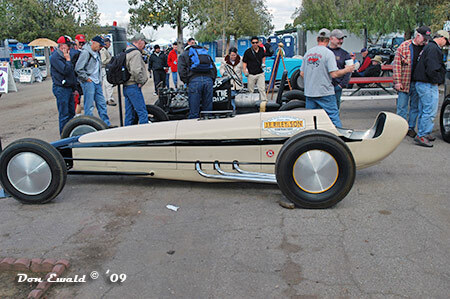 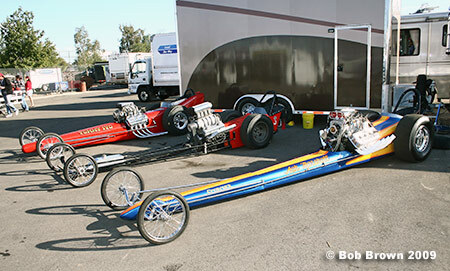 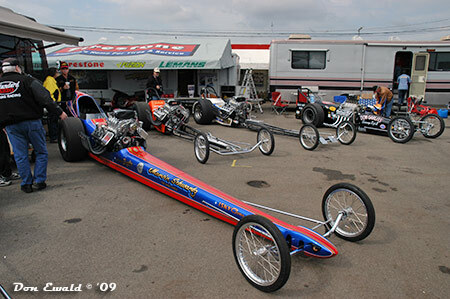 Cars included in the compound were Sonny Messner's Don Garlits Swamp Rat III, the Ewald Bros. BankAmericar, John Ewald's Mastercar, Bob Hirsch's Marvin Schwartz "Anaconda", Bobby Hansen's Wynn's Spoiler, Dennis Young and George Bukureshliev with the Ash Marshall "Scorcher", Ron Johnson's Shubert & Herbert and Tommy Ivo "Barnstormer", Paul Schavrien's "The Poachers", Baney & Rossi Yeakle Plymouth Spec. 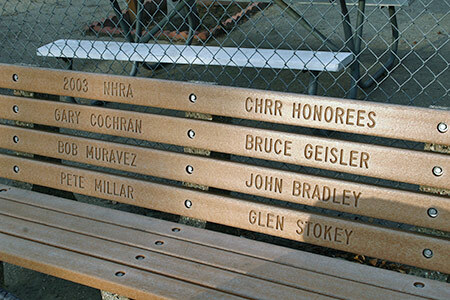 and the Warren-Coburn-Miller resto. 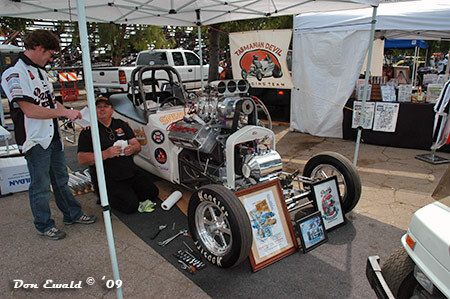 The first fan fire-up of the day was Mike Cox who owns the Glass House in San Dimus in the BankAmericar. 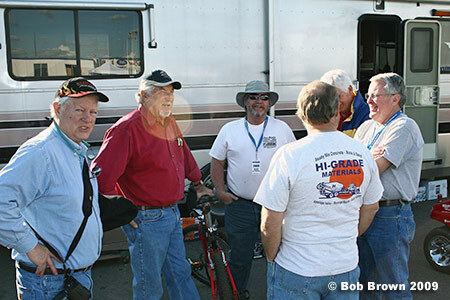 This woke everybody up big time and got the other players in gear. 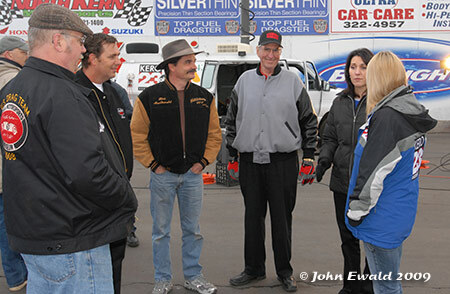 Bob Danly (aka McGiver) oversaw the fire-up. 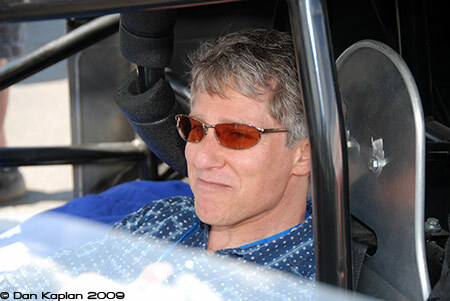 Immediately following the BankAmericar was the Mastercar with Dave Jackson in the seat. 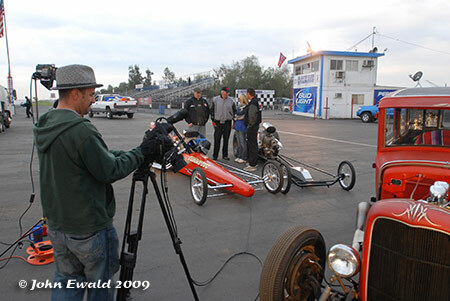 Dave has worked for comedy legend Jerry Lewis for the last two decades. 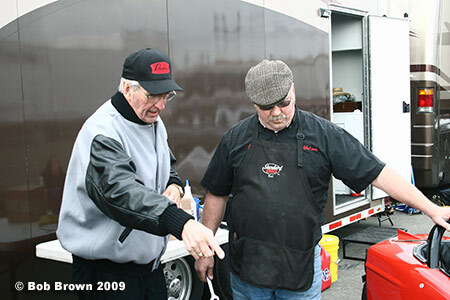 Sam Chastain loads the Anaconda with the good stuff. 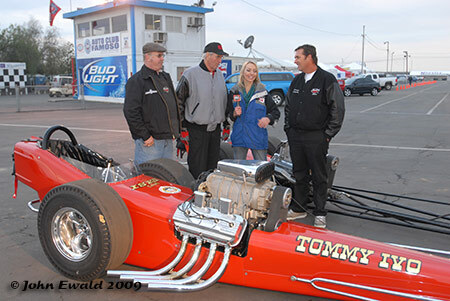 With owner Bob Hirsch in the seat the Anaconda drew a crowd. 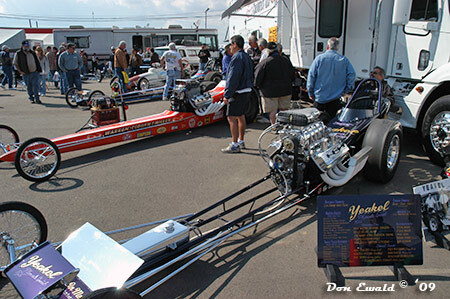 Paul Rossi never lets the dust setting on the Yeakle car. 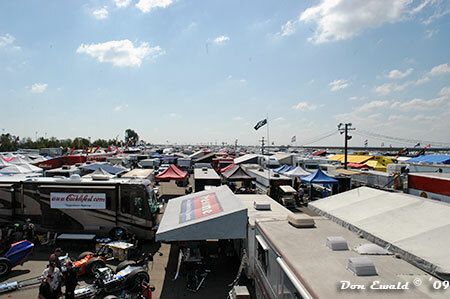 The "compound" from the roof of the Renegade Cacklefest Tour trailer. 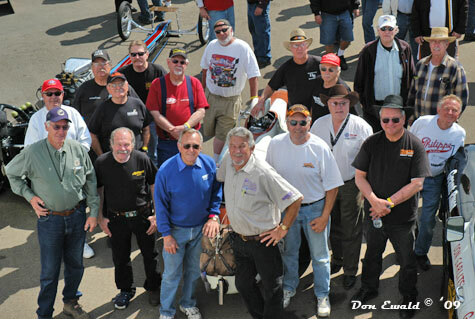 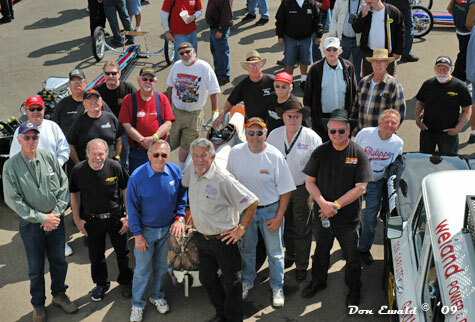 This was a gathering of those who were on hand that raced at the 1959 March Meet. 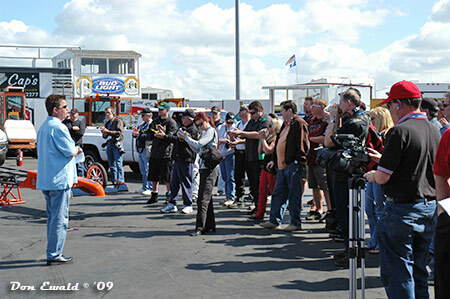 Pretty impressive turn out. 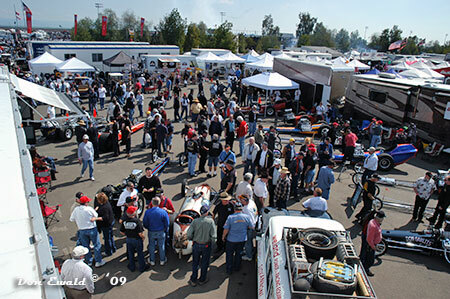 The pits were full from the staging lanes to the time ticket booth. 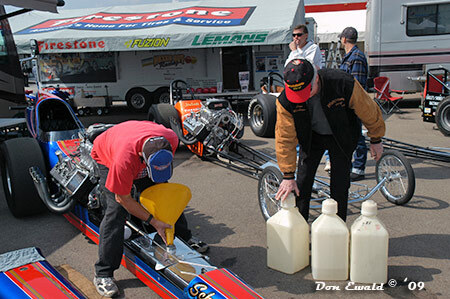 The staging lanes never seemed to be empty. 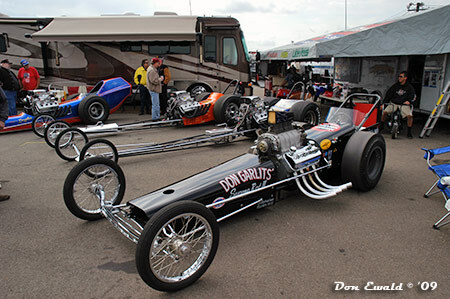 Back in The Grove, Mousie Marcellis was set up with the Winged Express. 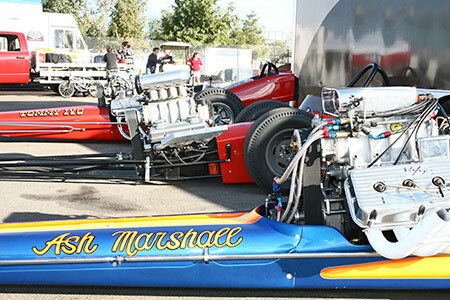 The McCloud brothers were on hand with their Dean Engineering Spec. 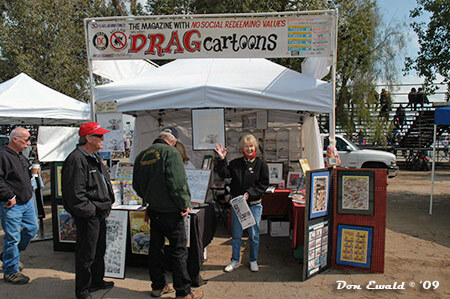 Orah Mae and Robin Millar were in their usual spot with their DRAGcartoon goodies. 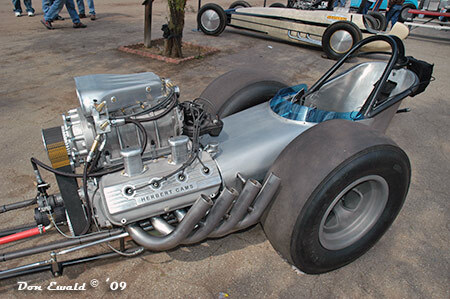 The March Meet marked the long awaited debut of Roger & Julie Lee's recreated the Brissette & Sutherland AA/FD. 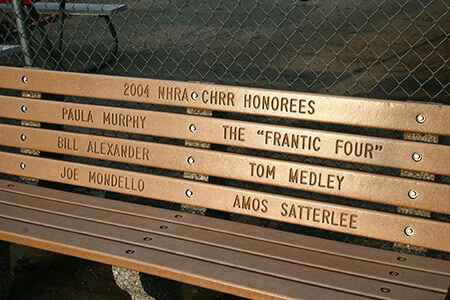 This piece has to be seen to really be appreciated. 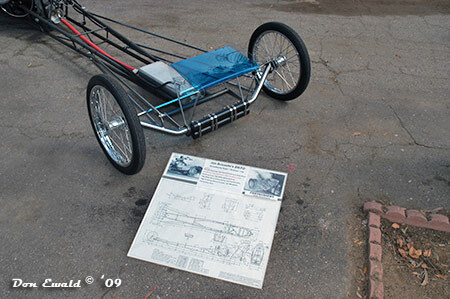 Lee, an award winning model builder, took this project to full scale building the car in his garage. 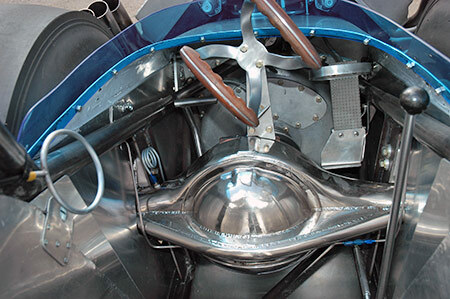 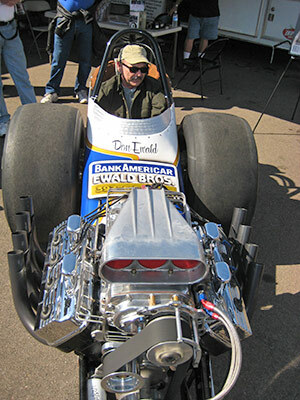 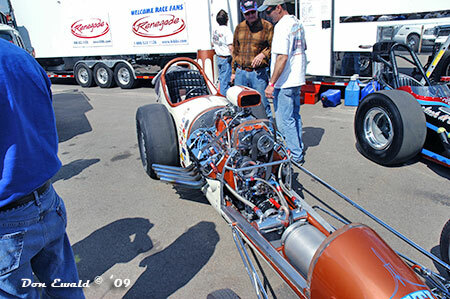 The fuel tank was replicated by the orginal builder, Doug Kruse, the tube bending and welding was the only things Lee didn't do. 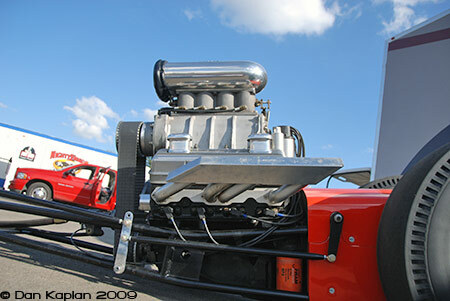 The 354 Hemi is being built by Dexter "POPS" Bradford and will be ready for the 2009 CHRR. 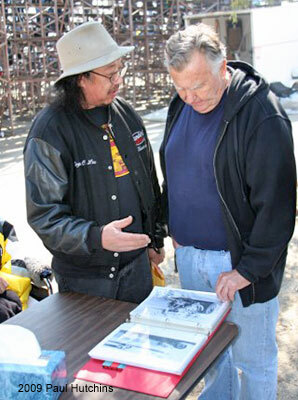 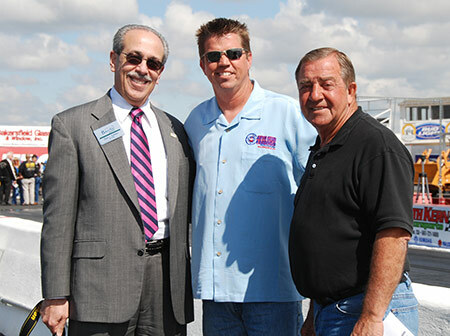 Lee started the project after getting the blessings of both Jim Brissette and Paul Sutherland. 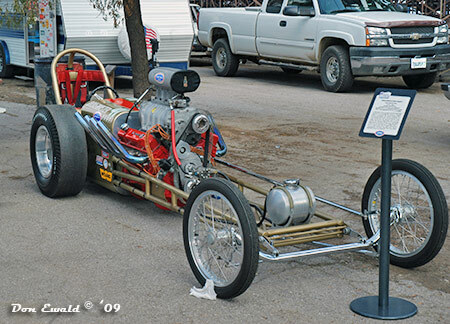 Since the original car was long gone, it had to be recreated from scratch. 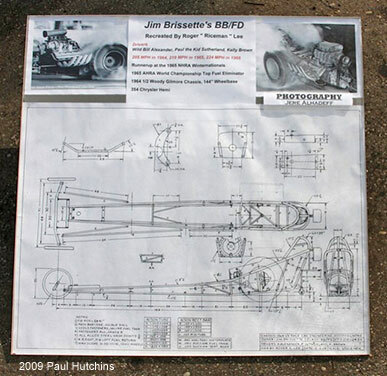 Working from blueprints drafted by himself, Lee did a brilliant job of bringing back one of the hardest charging fuelers of the 60s.... a bad to the bone "business coupe" digger that was built with function over form. 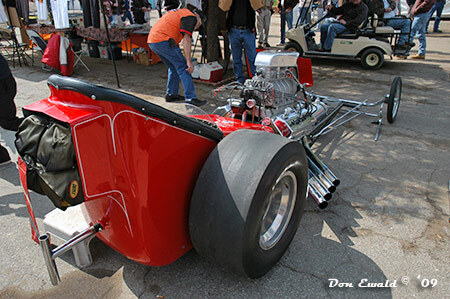 On Sunday Jim Brissette came out to see this masterpiece for himself and to say he was impressed and flattered would be an understatement. 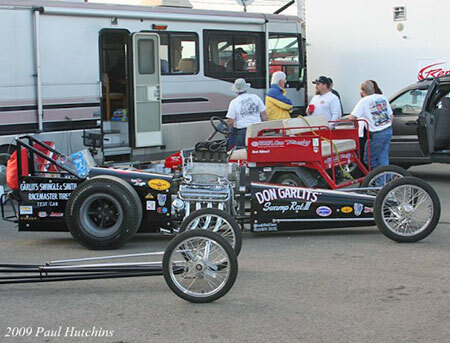 Dennis Prater's beautiful Stellings & Hampshire cackler. 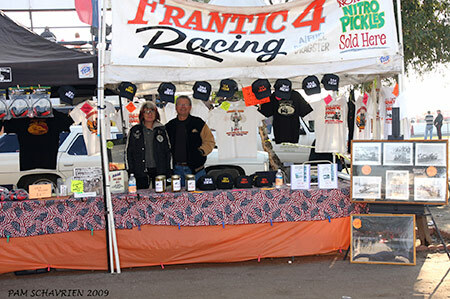 Back at the Frantic 4 camp Norm put Paula Roth in the car to test his new Kuhl tune-up. 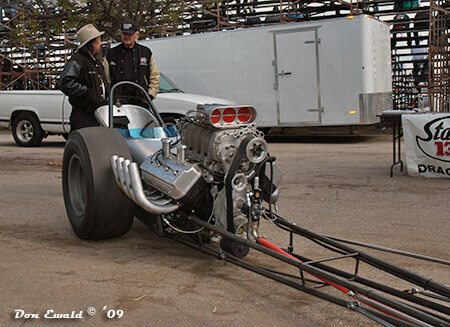 It sounded quite stout. 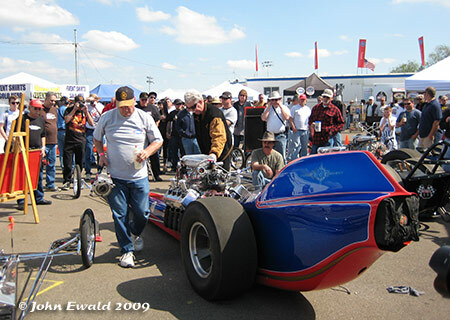 Back in the compound, by Friday afternoon there was a constant flow of fans especially when someone was doing a fire-up. 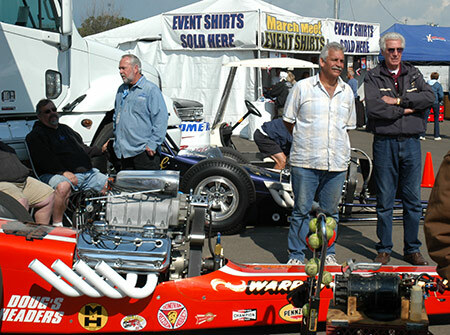 James Warren was a fixture in the area - wonder why?